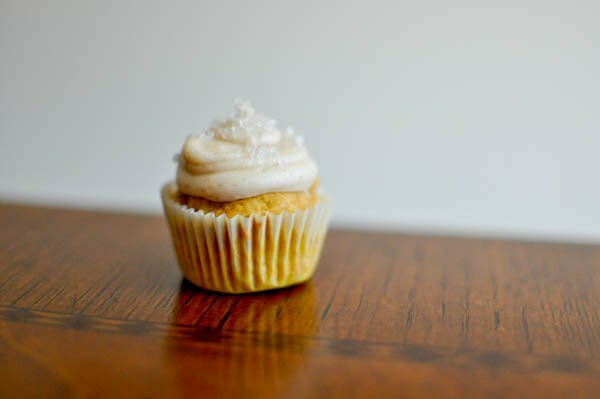 Last fall, I made some delicious pumpkin cupcakes. I made them over and over and over again. And then I ate them for breakfast, lunch and dinner. My goal yesterday was to try another pumpkin cupcake, but this time make it a bit on the healthier side. That way I could really eat it for breakfast, lunch and dinner. One thing I am not good at: staying out of cake and cookie batter. Major fail. Loved the way these turned out. All whole wheat flour, much less sugar, and no oil. Of course, there is still butter. I mean, who do you think I am? The cupcakes were still fluffy and moist. I put them in the fridge and snuck eighteen a few bites. They got just a tiny bit dry in the fridge, but as soon as I left them out at room temperature again, they were as fluffy as clouds. They tasted so incredible, I could barely tell they were a healthier version. Of course I couldn’t leave it at that. Me let things be? Never. I whipped up some pumpkin spice cream cheese frosting to pile on top. It made the cupcakes much happier. They feel whole. It keeps them warm. 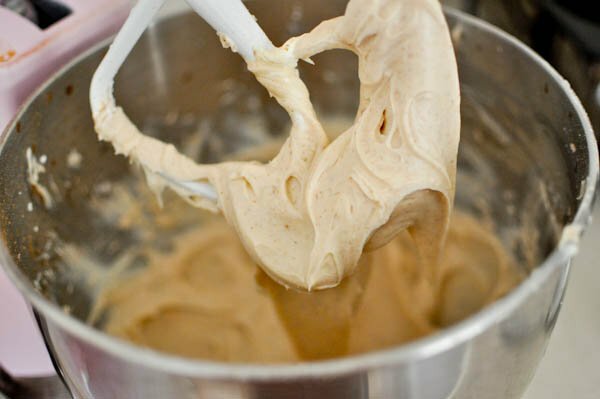 In a stand mixer cream butter and sugar until fluffy. Add egg and vanilla and blend. Add pumpkin and banana. Stir in flour, baking soda and powder, and spices. Add milk and mix until batter is smooth. Fill baking cups 3/4 full. Bake mini cupcakes for 11-13 minutes and regular cupcakes for 20-25. Cream butter and cream cheese together until smooth. Add vanilla and pumpkin spice. Gradually add in sugar and mix until desired consistency is reached. If mixture is too thick or dry, add some milk 1 tablespoon at a time. I’m taking these cupcakes on a road trip today to visit some very special people. Hope they are a hit! Mornings in the How Sweet Kitchen. 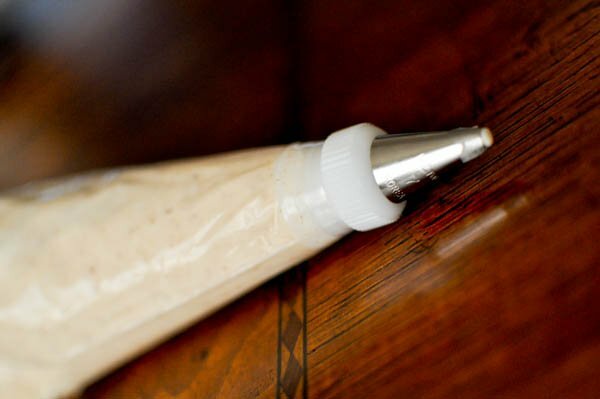 pumpkin spice cream cheese frosting? haha!! i have that SAME problem with eating all of the batter, so i chew gum, too! These look incredible! Congratulations on making them! All I can say is yum! Just went to an apple fest over the weekend and that applesauce looks like the perfect way to use my new loot! Congrats on the job change! I’ve been in the middle of one too so I haven’t been reading blogs lately, but couldn’t be more excited for you! It can definitely be scary, but I couldn’t be happier that I made the jump! I want that cupcake now! haha oh gosh sounds so yummy! I’m not sure if I did something wrong but this recipe does not rise! Beware! I tried it twice and even bought new baking soda and baking powder… no improvement. I had the same issue. Going to try the recipe for the pumpkin s’mores cupcake instead. Awesome! 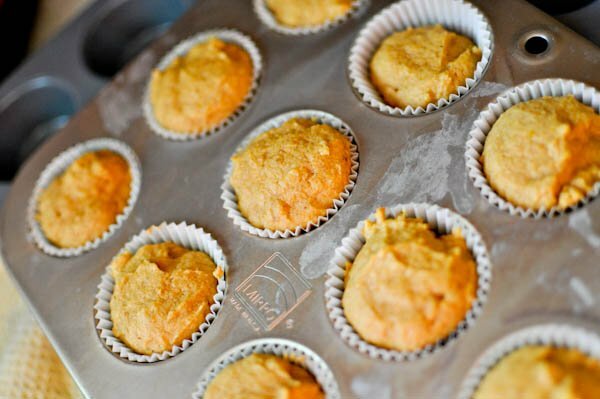 I was looking for a cupcake recipe for my daughter’s 1 year birthday in October, and thought pumpkin would be cool, and found this! Cannot WAIT to try it !! !